Lots of discs have appeared in my box lately on which great women musicians take on tunes and songs stemming from the old-time tree. I thought I'd share my thoughts on some of those here. I'll start with Laurie Lewis and Kathy Kallick, who have sung and played together since they founded the California bluegrass band The Good Ol' Persons back in the 1970s. They learned the craft of bluegrass from the acknowledged masters of the northern California scene, Vern Williams and Ray Park. Williams and Park's careers presaged Lewis and Kallick's important ways: both duos teamed up for a while to make some great music, then went their separate ways, reuniting only occasionally. 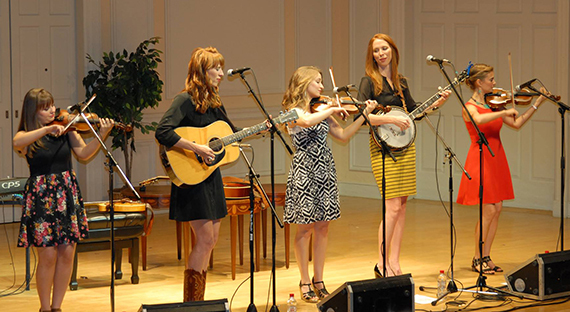 In the case of Kallick and Lewis, each fronts her own bluegrass band playing a mix of good old bluegrass numbers and self-penned songs, and they don't often record together. So it's a joy to hear them pay tribute to their late mentors on Laurie & Kathy Sing the Songs of Vern & Ray. The disc's material reflects the eclectic repertoire of Vern & Ray's band, finding the sweet spot among traditional folk music, early country classics, and more modern compositions, with everything from Foster's "Oh! Susanna" and "My Old Kentucky Home" to the Carter Family's "Cowboy Jack" and "My Clinch Mountain Home," and from folk tunes "Black-Eyed Susie" and "Flying Cloud" to Luther Riley's "Bluegrass Style" and Ray Park's "Thinkin' of Home." Themes of home and love, wandering and worrying, and God and prayer come up again and again, presenting the American experience crystallized in country music. Several songs stand out: Park's "To Hell With the Land" is a riff on environmental degradation, all the more chilling for being forty years old, and his "Happy I'll Be" is a simple gospel song that might just make you feel better. "Down Among the Budded Roses" is an unusual love song known to Charlie Poole and Woody Guthrie, and given a plaintive reading by Lewis, and "Little Birdie" is a lively folksong that's a perennial favorite in bluegrass. Both frontwomen are in great form, providing what Kallick calls the "razor-sharp laser-beam voices" that give traditional bluegrass its bite, as well as chunky guitar and fantastic lonesome fiddle, while bandmates Tom Rozum and Patrick Sauber fill out the ladies' sparkling arrangements on banjo and mandolin. This is my favorite bluegrass album in years! Here they are doing "Little Birdie." The Quebe Sisters have been building a reputation on impeccable fiddling, infectious Western Swing arrangements, and crisp swing vocals in the Andrews Sisters mold, melded into a seamless whole of string-based music that's equal parts jazz and folk. As Texas longbow fiddlers, the three young women won just about every championship available to them before deciding to challenge themselves further by becoming accomplished harmony singers. The result is a great roots-music success story. Their latest CD Every Which-a-Way presents old country songs like Hank Williams' "Cold Cold Heart," Western Swing standards like Cindy Walker's "Going Away Party," and Benny Williams and Joe Burke's "Yearning" (both recorded in the old days by Bob Wills), as well as Moon Mullican's title track. Finally, I'll mention the new solo album by Washington, D.C.'s own Martha Burns, simply titled Old-Time Songs. Burns is known for impeccable research into the background of her songs, as well as for simple tasteful guitar and singing, and all those are on display on this disc. The seventeen songs she picked are an eclectic mix, not all of them what you'd think of as "old-time." For example, there's a World War I Army song by Irving Berlin, and a clever ditty about disease that traces back to a comic operetta. But there are also old traditional ballads, including "Bangum and the Boar," which ultimately traces back to a medieval romance, and American disaster ballads, such as "Wreck of the Six-Wheeler." There are spirituals, mostly sung in shape-note style harmonies with guests John del Re and Kelly Macklin. There are also a good number of cowboy songs, including "The Night Guard," "Git Along, Little Dogies," and one of my favorites, Romaine Lowdermilk's "The Big Corral," which features nice harmonies by Bruce Molsky. One of the most unusual pieces, "Hop, Old Rabbit," blends the British sea chantey "Poor Old Horse" with African American stories of Brer Rabbit for a fascinating animal tale that Burns got from Horton Barker. Nothing demonstrates better than this reference in the poem of an East Texas cowboy Burns's own observation that old-time music thrives on a "mix of folk and cosmopolitan influences." For its own mix of such influences, this album is highly recommended.